Good Stuff NW: Farm Bulletin: Yellow Jackets, Wasps and Hornets, Oh My! Farm Bulletin: Yellow Jackets, Wasps and Hornets, Oh My! The Bard of Ayers Creek, Anthony Boutard, sends another bulletin from the real world. To subscribe to his missives, simply e-mail him and ask to be added to the list. Or visit him and Carol in person at the Hillsdale Farmers Market on Sundays from 10 am to 2 pm. 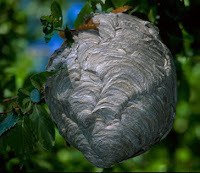 "We always have two or three bald faced hornet nests on the property. These are very valuable insect predators. The only time we remove the nests is when they are built in the berry field. Over the last few years, they have been located high in the oaks, bothering nobody. Unlike their close cousins, the yellow jackets, they tend to be pretty calm, and we have been spared their sting. Yellow jackets are almost as valuable. However, tending toward omnivory, yellow jackets are more inclined to damage fruit and tend to be wired with a hair trigger when you are near the nest. "When you stumble across a nest, it is impossible to outrun them, though a hasty departure is required. We have found the trick is to stand absolutely still against the trunk of the biggest tree nearby, and the wasps will circle in an upwards spiral around the tree looking for your head. Soon, they depart. The most likable of the group are the paper wasps who build small, open nests under the eves of buildings. They build nests on our heavy truck, and seem unfazed by the trip to Salem and back two or three times a week. They watch us keenly, but leave us alone as we work around them. The wasps, as a group, use their stinger as a tool to paralyze their prey, and they inflict a more painful and longer lasting injection than honey bees. 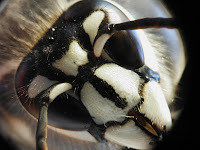 "Last week, we found a bald faced hornet nest in a drooping branch of a mirabelle plum tree but a foot above the ground. When we mentioned this to our crew, they noted the locations of a couple of other nests likewise close to the ground. New Englanders have always regarded low wasp nests as a harbinger of a harsh winter, the 'seventh winter' in a cycle. We had a sense of this earlier, and we have planted our sensitive crops in more sheltered locations than in the past, and are hedging with larger plantings of the more hardy greens. Consequently, it was interesting to hear meteorologists predict a colder winter this year for Oregon."